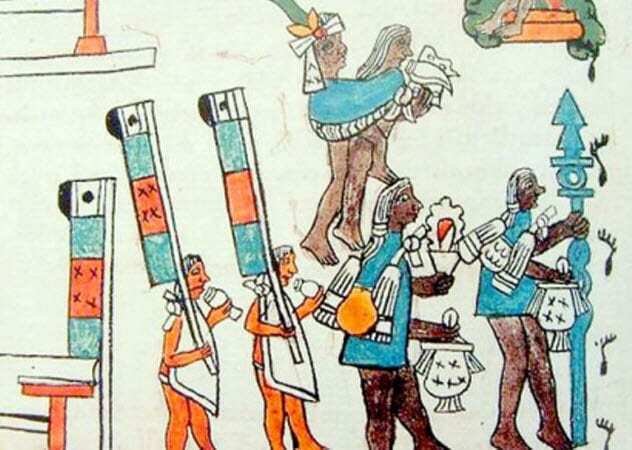 One hundred years before its fall, the Aztec Empire went through an incredible change. The emperor’s son, Tlacaelel, declared that the god of war, Huitzilopochtli, was to be the highest of all gods. 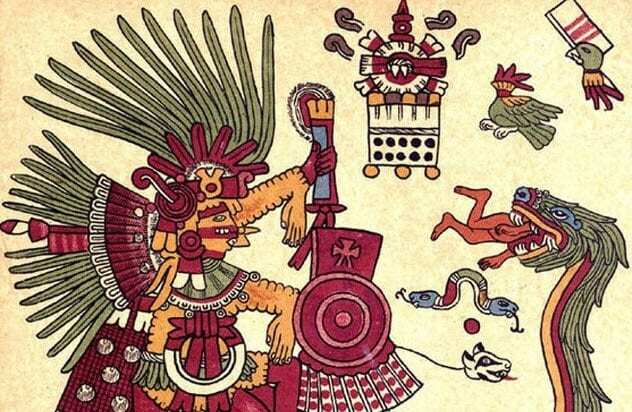 From then on, the Aztecs lived in service of the god of war. 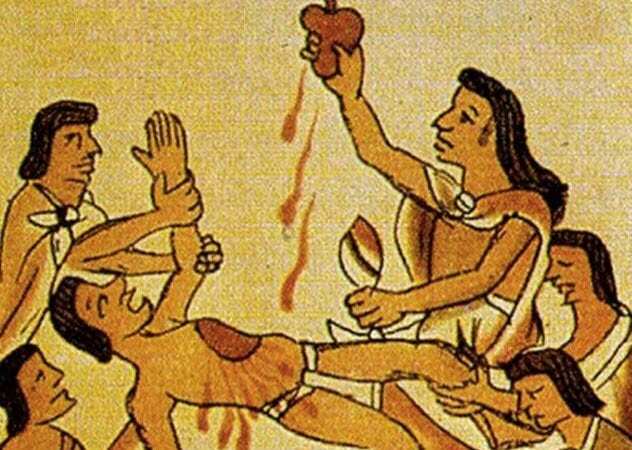 Human sacrifice became a massive part of Aztec society, with hundreds of thousands of people slaughtered each year as offerings to the gods. 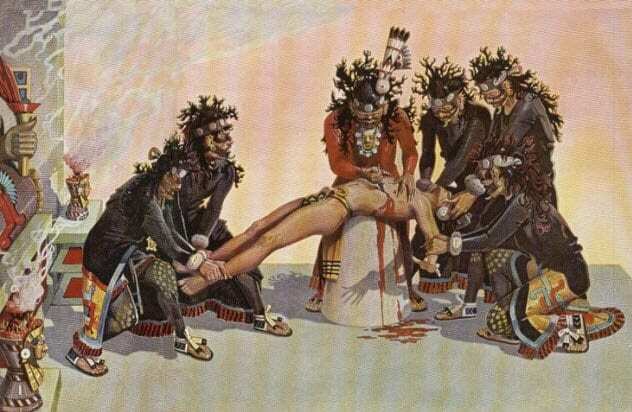 The Aztecs’ divine duty was to fill the insatiable appetites of their gods through human sacrifice. Usually, the Aztecs used enemies whom they had defeated in war as offerings. But there were only so many wars to be fought and only so many enemies to capture. They needed more victims. The Aztecs made a deal to use the neighboring city-state of Tlaxcala like a farm for humans. The two armies organized staged battles just to capture prisoners for human sacrifice. It was a mutual agreement by both sides. The losing army wouldn’t cry or complain about their fate. They understood that this was their part of the bargain, and they would allow themselves to be led to their deaths. To the brave, becoming a human sacrifice to the gods was an honor. In fact, when the Spanish came and tried to free Aztec prisoners, some were furious that they had been robbed of the honor of a godly death. It wasn’t just enemy soldiers who ended up under a ceremonial knife, though. Criminals and debtors were also sent to the altar in disgrace. Others signed up eagerly, wanting the honor of dying for their gods. By tradition, whole groups of prostitutes willingly signed up to be sacrificed to the goddess of love. During a drought, some Aztecs resorted to selling their children into slavery for 400 ears of maize. If the children didn’t work well, they could be sold again. And if a slave was sold twice, they could become a gift to the gods. During the month of Toxcatl, one man was chosen for a special honor based on his looks. He needed smooth, slim skin and long, straight hair. For the next year, this man would be treated like a god. He would be dressed up like the god Tezcatlipoca. His skin would be painted black, and he would wear a flower crown, a seashell breastplate, and lots of jewelry. The man would be given four beautiful wives to do with as he pleased. He was only asked to walk through the town playing a flute and smelling flowers so that the people could honor him. When 12 months had passed, he would walk up the stairs of a great pyramid, breaking his flutes as he climbed to the top. As an adoring crowd watched, a priest would help him lie down on a long altar made of stone. Then they’d rip his heart out of his body. Afterward, they would pick a new Tezcatlipoca and start all over again. Usually, a victim would be taken to the top of a great pyramid and laid down over a sacrificial stone. A priest would stand over him, holding a knife with a blade of volcanic glass. That blade would come down upon the victim’s chest and break it open, and the priest would tear out his still-beating heart. The priest would hold the heart up high for all to see. Then he would dash it to pieces against the sacrificial stone. The lifeless body would be rolled down the steps of the pyramid, where butchers were waiting below to dismember the body piece by piece. The skull would be removed and placed on a rack along with the skulls of the other sacrificed dead. Then the flesh from the body would be cooked into meals and fed to the nobles. The bodies of the sacrificed were often baked with corn and shared among the priests for a feast. Other times, enough was prepared for the whole city, and every person present would partake in a shared act of ritualistic cannibalism. The bones were then fashioned into tools, musical instruments, and weapons. 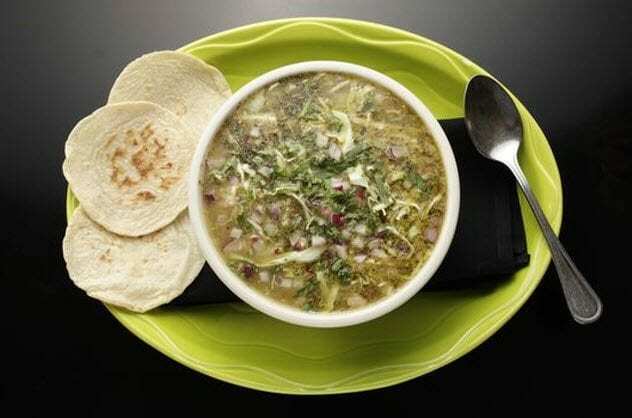 At least one dish they used in these ceremonies still exists today: pozole. In the time of the Aztecs, this was a soup prepared with thigh of a sacrificed prisoner and served to the emperor. Today, the dish is made with pork instead of human flesh, but the taste is pretty much the same. When the Christians forced the Aztecs to switch to pig meat, they reported that it tasted just like human beings. Not every sacrifice was normal. There were exceptional times when things were done differently. Sometimes, the methods were different. Other times, the difference was the sheer volume. The greatest was during the reconsecration of the Great Pyramid of Tenochtitlan. The Aztecs had spent years building up the temples in their capital city, and in 1487, the Great Pyramid was complete. They held a massive celebration to inaugurate their great temple—and slaughtered an incredible number of people. 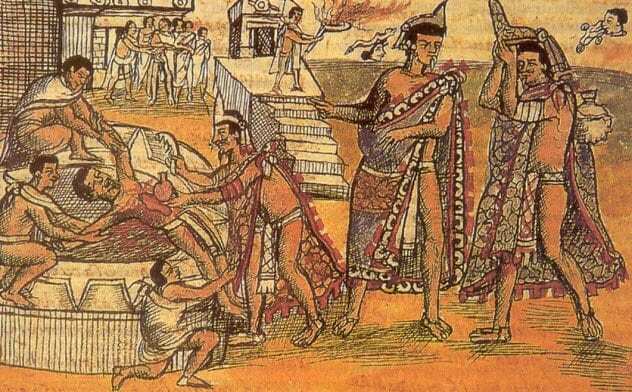 The Aztecs claimed that they sacrificed 84,000 people over a period of four days. During the reign of the Aztecs, an estimated 250,000 people were sacrificed across Mexico during an average year. Forty days before the festival, one man was granted the honor to dress like The Flayed One. He was covered in red feathers and golden jewels and spent 40 days honored as a god. Then, on the day of the festival, he and eight other impersonators of gods were brought to the top of the temples and killed. The priests skinned the bodies of the sacrificed men in an imitation of a plant shedding its husk. The skin was then dyed yellow to look like gold. Some skins were given to priests, who danced in them. Other skins were given to young men, who spent the next 20 days begging while draped in a loose coat of human flesh. During The Festival of the Flaying of Men, some men were given the chance to defend themselves. 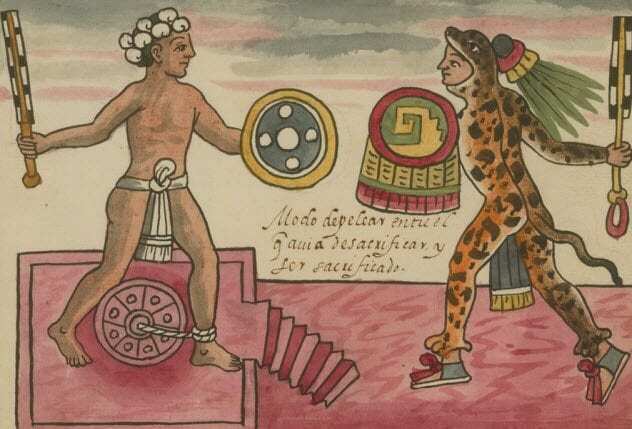 To live, though, they had to defeat the greatest Aztec champions in armed combat—and the odds were not even. The sacrificial warriors were led onto a circular stone called a temalacatl. They were allowed to carry wooden weapons that were little more than toys. Holding a stick whittled into the shape of a blade, these men watched as the greatest Aztec champions marched out, armed to the teeth. 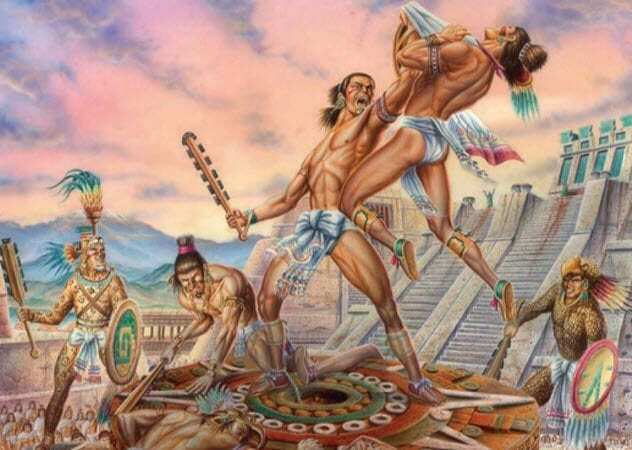 According to Aztec legends, one man named Tlahuicol actually survived. With nothing but a wooden sword, he single-handedly killed eight fully armed Aztec warriors. The Aztecs were thrilled, and they offered to make him the commander of their army. Their offer, he told them, was an insult. Tlahuicol was meant for a far greater fate. He was to be sacrificed to the gods. The Aztecs had odd and often contradictory beliefs about twins. Their myths were full of twins, usually treated as venerated deities worthy of the worship of man. Twins appeared in their stories as monster slayers, heroes, and even the creators of the world. Real twins, though, were treated with complete contempt. They had one god, Xolotl, for both deformed children and twins because the Aztecs considered twins to be a deformed child. They saw twins as a mortal threat to their parents. Allowing twin babies to live would mean the end of your life. So most parents chose one of their baby twins and sent it back to the gods. 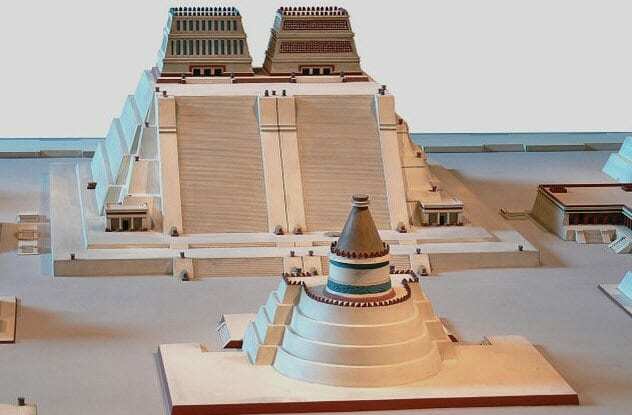 At the heart of the Aztec capital, Tenochtitlan, were twin temples. At the peak of the one dedicated to Tlaloc, the Aztecs held the most terrible and saddest ritual of them all. 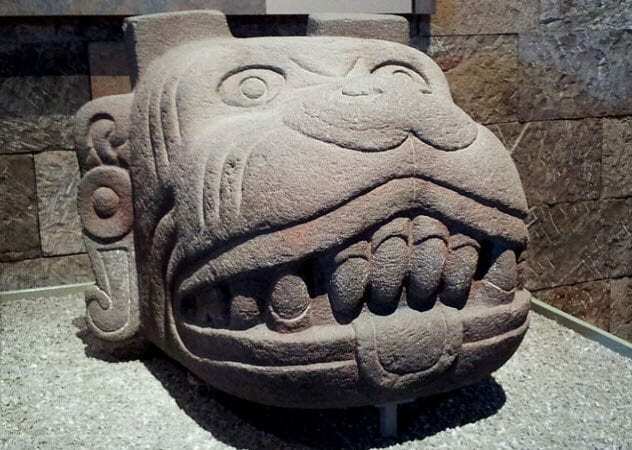 Tlaloc was the god of rain and lightning—and he demanded children. During the late winter month called Atlcahualo, the Aztecs would bring children to the temple of Tlaloc and force them to walk up the steps. The children were not willing volunteers, and they wept as they went up. If the children cried, the Aztecs believed that Tlaloc would bless them with rain. So if the children did not weep on their own, the adults would make them. When it was done, the children were brought into a cave outside of town. They were laid in a circle under an open roof. There, under the open air, the rain brought about by their sacrifice would drizzle down upon their bodies.